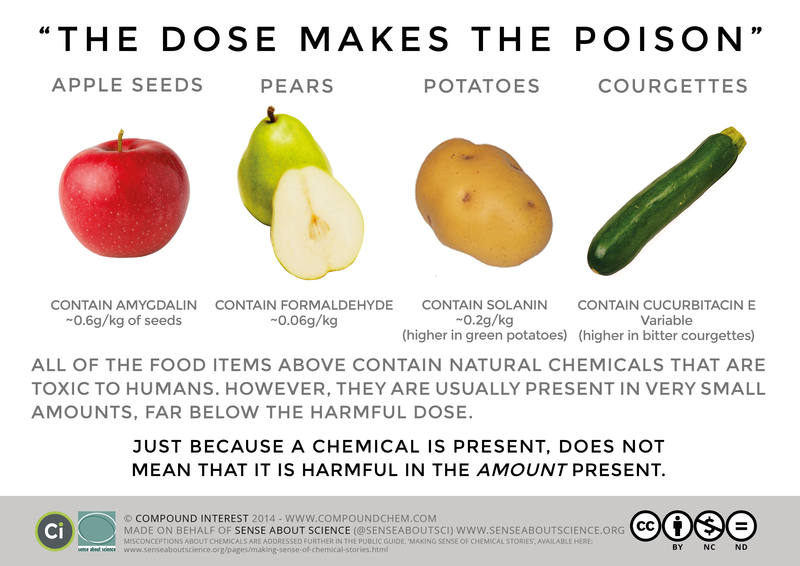 Discussions on chemophobia (or whatever you want to call it) is a perennial favourite on chemistry blogs. But the conversation rarely extends out of our echo chamber. 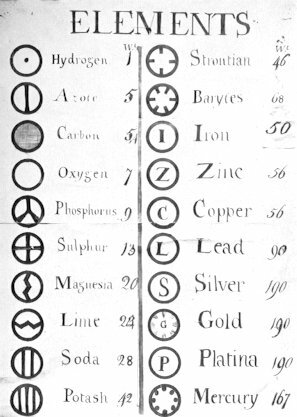 But now Sense about Science have joined the discussion with the publication of a guide entitled Making Sense of Chemical Stories. Sense about Science is a respected charitable organisation that ‘equips people to make sense of scientific and medical claims in public discussion’. In short, they facilitate discussions between concerned/interested groups and relevant experts. 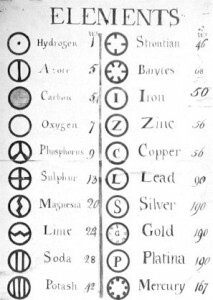 The aim of their guide is to bridge the disconnect between the lifestyle view (and popular definition) of chemicals and the realities of how chemistry is used to support the modern world. It does this by tackling common misconceptions about chemistry. One of the key misconception that they address is that natural chemicals are somehow safer than man-made ones. 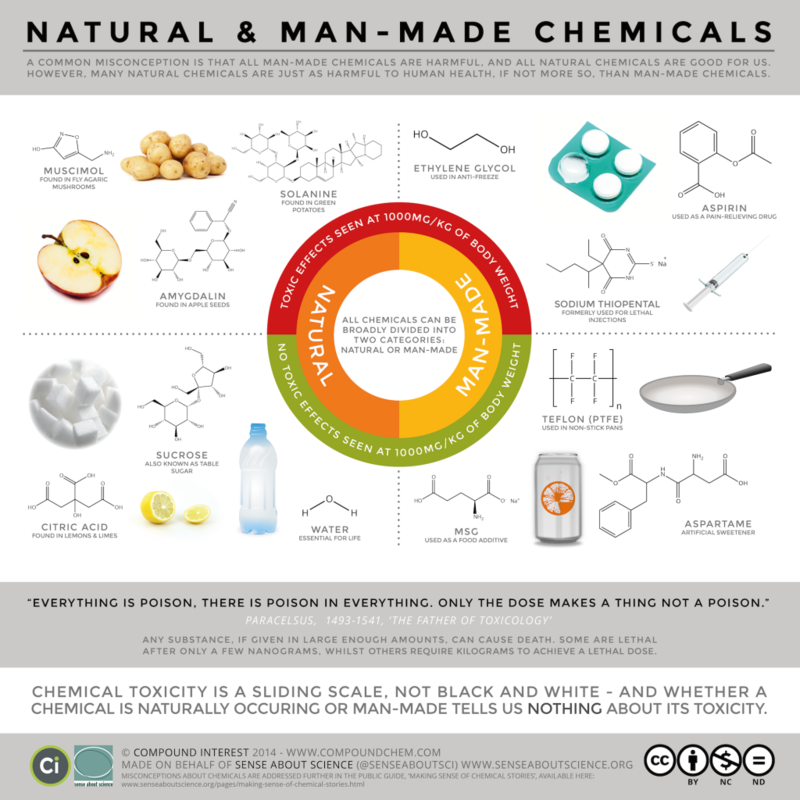 The wrongheadedness of which is nicely illustrated by a pair of infographics (designed by Compound Interest) that don’t shy away from admitting synthetic chemicals are often toxic but also make it clear that whether a chemical is naturally occurring or man-made tells us precisely nothing about its toxicity. Making Sense of Chemical Stories is being promoted to the public, journalists, life-style press and policy makers. It, along with the infographics are freely available to download and distribute under a creative commons license. Or if you prefer a hard copy (or box full of them) email enquiries[ at ]senseaboutscience[dot]org with your contact details. This week Fred Sanger died at the age of 95. 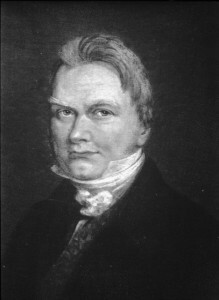 His name is probably unfamiliar to most, but he is considered one of the greatest chemists of our age. He is the only person to have won two Nobel prizes for chemistry (only three others have won two Nobel prizes – Marie Curie, Linus Pauling and John Bardeen). Sanger’s lack of fame is in no small part due to his humble nature and modesty. His sole autobiographical article, written five years after his retirement, starts with the self-deprecating comment: “I was not academically brilliant”. But there is no false modesty here, the article makes no mention of the numerous prizes and honours bestowed on him. These included a knighthood which he turned down, not for any moral objection to the honours system, but because he did not like the idea of being addressed as “Sir”. Sanger spent his career studying the three fundamental polymers of life – proteins, RNA and DNA. It had long been known that DNA and RNA were made up of strings of just four bases, while proteins are more complicated, consisting of strings of 20 amino acids. However, just knowing this is like understanding that sentences are made of letters but having no idea what order the letters come in. Sanger strove to decipher the order of DNA and RNA’s bases and protein’s amino acids. Other great (and many familiar) names such as Francis Crick, James Watson, Rosalind Franklin and Max Perutz worked on the 3D structures of these molecules. 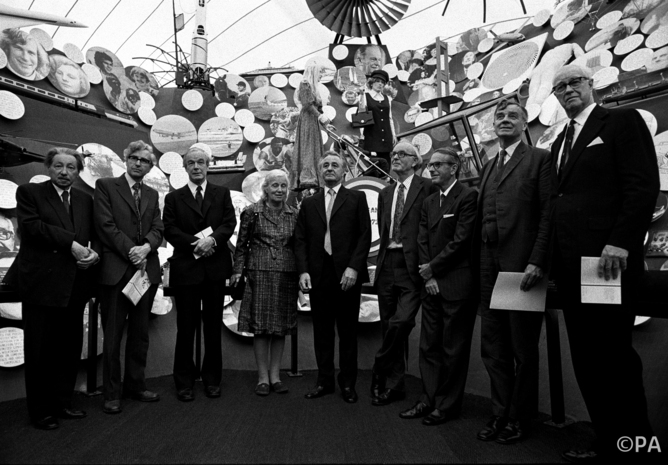 But Sanger’s work was more fundamental and arguably more useful – he laid the bedrock on which some of the greatest achievements of 21st century science such as the Human Genome Project and all that has followed were built. Of the three main activities involved in scientific research, thinking, talking and doing, I much prefer the last and am probably best at it. I am all right at the thinking, but not much good at the talking. This quote speaks volumes about his values as during this “lean” “depressing” period Sanger was awarded, for his work on insulin, one of his Nobel Prizes. This period came to end when Sanger began work on sequencing RNA and DNA. In 1971, state-of-the-art science had managed to determine the sequence of a stretch of DNA just 12 bases long (not much use considering the human genome consists of 3 billion bases). By 1978 Sanger had extended the record to 5,386 bases and then to 48,502 bases by 1982. These advances demonstrated that it was now possible to sequence vast stretches of DNA. It was for this work that he was awarded his second Nobel Prize, in 1988. But, probably of more value to Sanger was the knowledge that the DNA sequencing he developed made the global Human Genome project (instigated in 1990 and involving thousands of scientists) possible. As far as Sanger was concerned, his DNA sequencing method was the climax of his career – and so at the age of 65, at the top of his game, he retired and gave up research. Retiring at 65 may not seem odd, but its is rare for a top scientist where a lifetime spent single-mindedly pursuing knowledge is a hard thing to give up. Sanger was different. He felt the need for a lifestyle change and heeded the call of his rose bushes. He also wanted to make space for younger scientists, many of whom, through his nurturing, went on to win their own Nobel Prizes. So for the next 30 years he focused on his gardens in Cambridge, never once revelling in the glory that was so rightfully his. Because we are aren’t we? Really what’s the point? We should be off writing grant proposals, research papers, and (if there is anytime left) maybe do a spot of teaching. Blogging’s not going to get us anywhere, nobody takes it seriously so ,frankly, let’s all just pack it in and get on with some proper work. And if by chance we do stumble across something important (possible plagiarism or fraud maybe) then really we’d best tell the big boys and they’ll sort it out. If we really feel the need to write something about it then we can report the situation once its all sorted out. At least that’s what some members of the community would have us do. Take the commenter (going by the name of bloggersaretimewasters) who responded to Chembark‘s eloquent rebuttal of ACS Nano editorial attempt to put bloggers in their place. I took the liberty to check out your website at Saint Louis University. I am not sure what the requirements for tenure are in your department, but I can assure you that if you keep up the meager publication output you have had so far (despite working in excellent labs at outstanding universities) you would find it difficult to obtain tenure at a serious and reputable University (though you would likely have a good shot at a community college). I have also cross referenced the publication output and credentials of several other “bloggers”, like yourself. What you all have in common, besides the self-proclaimed notion that you are doing the community a huge favor by uncovering so many frauds left right and centre is… a modest publication output and an overall “low” scientific profile. By low I don`t mean that you keep a low profile out of modesty, mind you. Bottom line. How about you people try to forge your careers through your own discoveries and original scientific inquiries, rather than try to get ahead by attempting to undermine the work of others? Ah wait, I guess many of you don`t do it because you are not able to. That`s too bad. You are wasting a lot of time and resources… I guess it will not really hit you until you are denied tenure. It seems you have started your tenure track position very recently, so maybe you are still in time. Please consider this post as a wake up call, because the day your tenure is denied (through peer review, mind you, not by declared or anonymous bloggers) it will be too late… game over! I’m sure this attitude is far from uncommon. The majority of the people who think along these lines probably don’t bother reading our “time-wasting” outputs so certainly wouldn’t bother commenting on them. But, in my experience, this is an increasingly archaic view point. I have a permanent academic position in a UK university. I was recently promoted to the Senior Lecturer (UK equivalent of Associate Professor) not despite my blogging and other engagement activities, but, in no small part, BECAUSE of them. And increasingly, certainly in the UK, the need for scientists and academics to effectively communicate their views and work to a wider audience is being recognised: Nature Chemistry highlights bloggers outputs in every issue and take a look at the success of The Conversation, a news site written entirely by academics and sponsored by top research Universities such as Warwick, UCL, and Bristol as well as agencies such as the Wellcome Trust. Or on a smaller scale Guru Magazine again written largely by academics and funded by The Wellcome trust. Yes my publication list would probably be longer if I did less blogging. But the same goes for spending time with family. Maybe I should stop wasting my time with them as well?